I’m home for a day! Just long enough to wash clothes, repack the motor home, and leave you with the cinnamon roll recipe I made for my younger brother Steve and his wife Dorian this weekend. When Steve or I visit anyone we always bring food. There’s some powerful genetic pull that makes us overfeed anyone around us. We get it from our father, who will throw together eight dishes at once for a crowd of six. This time I brought homemade marshmallows, and the recipe to make these heavenly Cinnabon clones I found on AllRecipes.com. We started off early Saturday morning with our rafts and tubes, meeting up with the Knutson’s Chevrolet crew to float down the Coeur d’Alene River. The river is wide, slow, and shallow, which makes it perfect for a lazy afternoon float. We brought beer and food of course, stopping off several times to snack and swim. The kids had a blast, although I think at the end of the four hour float they were ready to get off the rafts. Later that night we roasted the homemade marshmallows and made smores. I also spent a few minutes prepping the dough for these cinnamon rolls (the bread machine did most of the work), then oiled a large bowl, tossed in the dough and coated it in the oil, covered it in plastic wrap, and stuck it in the refrigerator for Sunday’s breakfast. I took the dough out of the fridge when I woke up, and let it warm to room temperature before rolling it out. I have lots to do so I better get started this morning. I’m heading out tomorrow to pick blackberries and explore my own state some more. Idaho is beautiful in the summer and I don’t want to miss it. 1. Place the dough ingredients in the pan of the bread machine in the order recommended by the manufacturer. Select dough cycle; press Start. 2. After the dough has doubled in size turn it out onto a lightly floured surface, cover and let rest for 10 minutes. In a small bowl, combine brown sugar and cinnamon. 3. Roll dough into a 16x21 inch rectangle. Spread dough with 1/3 cup butter and sprinkle evenly with sugar/cinnamon mixture. Roll up dough and cut into 12 rolls. Place rolls in a lightly greased 9x13 inch baking pan. Cover and let rise until nearly doubled, about 30 minutes. Meanwhile, preheat oven to 400 degrees F (200 degrees C). 4. Bake rolls in preheated oven until golden brown, about 15 minutes (Mine took 18 minutes, I like them a little more well done). While rolls are baking, beat together cream cheese, 1/4 cup butter, confectioners' sugar, vanilla extract and salt. Spread frosting on warm rolls before serving. Cinnabon clone recipe from AllRecipes.com. Picture by Laura Flowers. Cream cheese icing is by far the best frosting for cinnamon rolls!!! Great photo, as usual!!!!! What a great post~ Words and photo.Have a ball. Have fun exploring your state. I am a sucker for cinnamon rolls. Nice job! Yum! Looks nice and moist! wow!! I can see that your kitchen is open. I envy you, you are having so much fun. I love your picture, I really need some long distance classes. I adore my bread machine! These look like such great cinnamon rolls. Oh my, these are delicious. Homemade treats are the best. Thank-you for the comments everyone! See you soon. Ummm, I'd like one of those now with a lovely cup of tea. So glad you are getting out to enjoy such a beautiful state! My husband's family has a cabin in Kirkwood that is absolutely wonderful, and a few profs in my department have cabins in Chatcolet Bay on the Lake Coeur d'Alene, so I've always been a big fan. Have a great time, although in gorgeous Idaho, I think it's harder not to. This blackberry picking expedition is not going to involve another unlawful trespass, is it? I love me some Cinnabon!! Yours looks amazing! What a great recipe! Sounds like I'll have to bring the good old bread machine out of the cupboard again! I've made these three or four times before for my stepdaughters, and they loved them! I even made a double batch, and they ate them up within 2 or 3 days. Oh, for those who have never made these and are craving Cinnabon Cinnamon Rolls, these do not taste like them, but they are still very good. I wish you could just stop by my place and snap my photos for me- you make me so jealous! 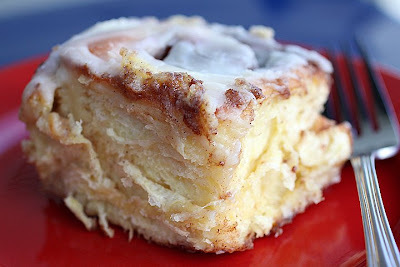 I LOOOOOOVE cinnamon rolls of every kind :) Fabulous! Congrats on the Serious Eats mention! How awesome. Also, jealous of the Cinnamon rolls. Salt in your icing? I'll have to try that. Also like the red plate. I have tried to photograph several items on my red plate but somehow it doesn't work. I think I'll try again. omg, I have been dying to find a recipe that replicates those delicious, warm and gooey buns! I was going to try the ones I found on the King Arthur website, but I may try these next. Are they really anywhere close to cinnabons??? These look phenomenal! I'm pretty much drooling since I skipped breakfast today :) I keep a running to-do list on my blog of recipes from other blogs I'd like to make... just added this to the list! Thanks! Damn - I want those RIGHT NOW! Wow! Cinnamon buns and S'Mores with homemade marshmallows must be two of my favorite things! Those "clones" look so delicious and fluffy. Will try! Hi, I just found your blog and am very happy I did! These look incredible! I bookmarked them on Delicious so I can go back to them when it's cooled off enough to turn on the oven! I am glad you found me too!! Welcome! You made these? Germany has the most amazing breads in the world and you made these Cinnabon clones instead?? Can I come visit you? Teasing aside, I am so glad you liked these!! they look so fluffy and soft. great job!